NEW YORK (WABC) -- Ask any die-hard Yankees fan, and most of them will tell you the new Yankee Stadium just doesn't have the same feel as the old one. Even though the team won a World Series there in 2009, it has never had the aura or mystique felt inside the House that Ruth Built. Those days are gone. The parties we've seen in the House that George Built over the past two weeks remind you of the late 1990s and early 2000 Pinstripes. 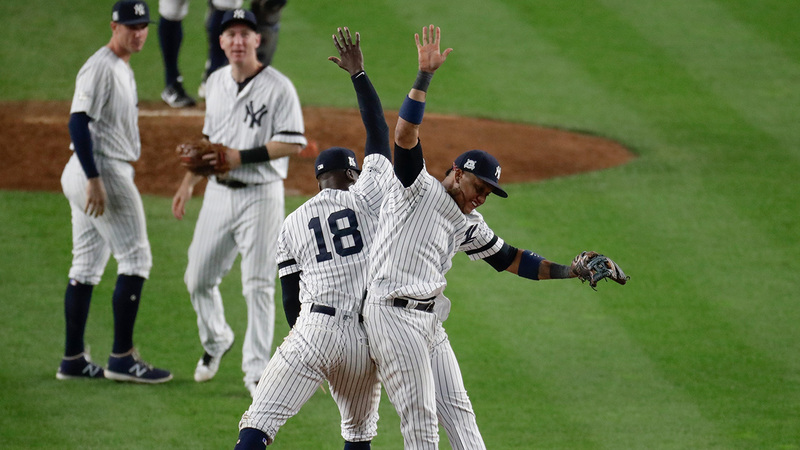 The mix of youngsters and veterans is breathing new life into Yankee Stadium, and that momentum could carry this team all the way to its 28th World Series title. Oddly enough, one of the driving forces behind that old-time feeling is a guy who sat in the stands in the old stadium. Todd Frazier has been a lightning rod for the team, at the plate and even in the dugout. It seems whenever the camera finds him, he's cheering on his teammates or giving the team's signature thumbs down. We all know Frazier's story by now. He grew up in Toms River, where he helped his team win the Little League World Series in 1998. That win got him on the field with his idol, Derek Jeter, for a picture that is quickly becoming a part of Yankee lore. Now, Frazier is leading the charge for a team that is exciting to watch and downright fun to root for. The Yankees changed their ticket policy in 2016 that led to comedian John Oliver calling the franchise "elitist." Surely, there are thousands of Yankee haters out there who would use the same term (or worse) to describe the Pinstripes. But the fans in the bleachers who were going crazy Tuesday night when the team erased a four-run lead -- those fans are not elitist. Those are the same rough and rowdy fans who embraced the animosity when the Bronx Bombers were the most hated franchise in America. Now, these Baby Bombers are one win away from returning to the Fall Classic. What's even more intriguing is their likely opponent, one of the team's biggest rivals, the Los Angeles Dodgers. It's an exciting time to be a baseball fan, and whether you're rooting for them or against them, the Yankees are a big reason why.